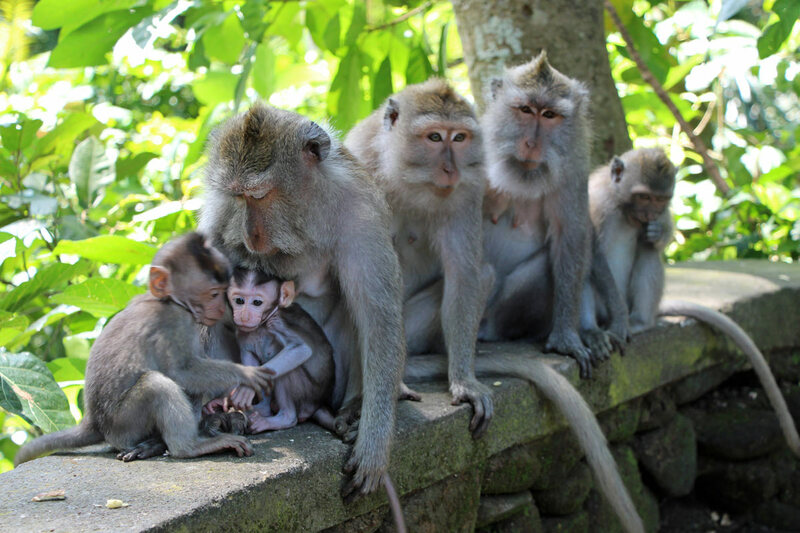 A lot of monkey business goes on at the Sacred Monkey Forest Sanctuary in Ubud, Bali. The shady forest is a 30-minute walk downhill from the town center cross-roads. It’s the jungle home to three 11th-century holy temples and over 550 cheeky long-tailed macaque monkeys. Monkeys are important in Balinese culture, portrayed in the “Ramayana” Hindu-based dance epic, the “Kecak” dance, carvings and other art. And the Monkey Forest isn’t just a popular tourist attraction – it’s actually a sacred site. It was nice to see that the monkeys, which have the run of the place, are well looked after in the reserve. Temple attendants ensure you aren’t too bothered when the monkeys jump on you, which they do. Every now and then, we’d hear screams (then gales of laughter) from hapless tourists when a monkey would clamber up on them or pull at their skirts. This gent doesn’t mind a monkey on his shoulder :-). We removed our watches and jewelry before visiting – we were warned the monkeys try to pull off your earrings or other jewelry, thinking it’s food or something fun to play with. But the little green hand sanitizer bottle hanging from Janice’s backpack was like catnip (monkeynip?) for them. They kept trying to yank it off, and would climb up Janice’s pants leg and hang on to her backpack to grab it. It was difficult sometimes to shoo them off! Hello there! What are you thinking? Is a little grooming in order? The grounds themselves are a cool respite from the sweltering heat – a dark shady forest with huge banyan trees and stone temples. The Holy Spring Temple is down a long flight of steps next to a stream in the jungle forest. To reach it, you walk across a moss-covered stone bridge high across the stream; long banyan vines hang down above you and below. We almost felt like we were on the movie set of a Raiders of the Lost Ark remake. Veer off down some slippery steps and you also see two large Komodo dragon statues there. But the monkeys are the star attraction. We spent a whole morning watching them. One monkey kept rattling a coke can with a pebble inside, another rolled a marble on the ground with a leaf, and a third had grabbed someone’s camera lens cap and was playing with it. Particularly adorable were the scrawny and hairless black babies clinging to their moms and suckling. People from around the world – Japanese, European, Indonesian, a few North Americans – were visiting the Ubud Monkey Forest. Ubud has definitely been discovered! And like us, all were enthralled by the monkeys. Ubud boasts a great cultural scene (Balinese dance and art galleries). See here! Mom, can I have some milk please? Treat the monkeys with respect – they are wild creatures and could bite. 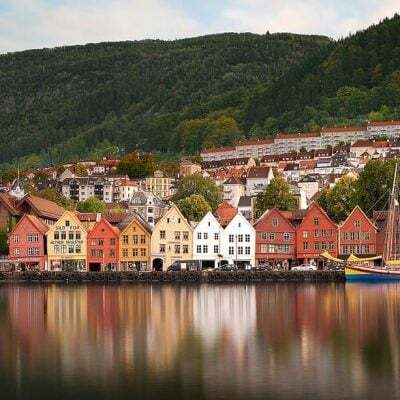 Keep your camera close to you and hang on to your things. Don’t wear jewelry, watches or anything you’d regret losing. You can buy bananas at the entrance gates to feed the monkeys. But beware if you do. They will jump on you to get at the bananas; they can smell them even if hidden in your backpack. Would you mind monkeys jumping up on you? Wow, these monkeys look amazing, especially the little ones. I want to go there to see how they come to steal bananas. Awww what great photos! The monkeys look so innocent and then there’s a picture of one standing on someone’s head. Reminds me of the white face monkeys here in Costa Rica, they are quite mischievous! Guess it must be in their nature ! I absolutely loved watching the monkeys in Ubud, one of my favourite places in Bali! We are going to Ubud next month and I can’t wait to visit all of the temples and this monkey forest. I have been doing my research and seems like buying bananas isn’t really the right thing to do. I want to look at the monkeys, but don’t want to have them climbing on me. Well, you’re visiting Bali in the right month! (the coolest). And you’re making the right decision about letting other visitors buy the bananas – so you can laugh as the monkeys climb up on them :-). Great photos! Aren’t those babies the cutest things? I’d love to see the monkeys and I can definitely understand the attraction of watching them all afternoon! Sounds like they could be stiff competition for the temples! These monkeys are adorable! Lovely photos. They are curious creatures, aren’t they?! Who knows what they were thinking that a hand sanitizer was. Or perhaps they just wanted to sanitize their hands after playing with all those objects – you know, who knows who drank from that coke can, or whose camera lens cap that was?! Well, they are pretty smart, aren’t they? Amazing! I would love to visit these temples, but I think I might be scared of the monkey’s especially if one jumps on me. The little ones are definitely adorable. You got some great pictures of them as well. Thanks for sharing! These monkeys look adorable!! Reminds me of “The Jungle Book” – as a kid, the scene with the monkeys at their temple always made me want to go there. Little did I know there exists a place just like it in reality! The zoo in Omaha, Nebraska has different habitat domes where the animals have free reign of the place – the Desert Dome and the Rainforest Dome. Those were a favorite as kids. If I’m ever in Bali I’ll have to make it a point to go to Ubud! You captured those cheeky creatures perfectly. I could watch them for hours. The first photo of the family is gorgeous. It looks like a great place to interact with the monkeys and get an idea of what life would be like as a zoo keeper. The babies are so sweet, although the older monkeys grabbing at my hair would not be my thing. I love the safety of enjoying your photos instead of being in their midst. I don’t think I’d be comfortable with monkeys jumping on me, but it would be fun to see all the monkeys in Ubud Monkey Forest. I love the picture of the gent with the monkey on his shoulder. And the Holy Spring Temple is impressive. Oh this brought back fond memories! My sister and I were there a few years ago and laughed ourselves sick over the monkeys fighting for the bananas the attendants threw in a fountain. Our favorite thing was that the young monkeys fought like crazy for the bananas and the old ones just walked along the edge of the fountain and calmly scooped out the ones they wanted. Just like with humans! Even people who wouldn’t mind a monkey jumping on them should be VERY careful to prevent that because rabies is a very serious problem on Bali. About half a dozen people have already died of it this year making me suspect the medical care isn’t up to par for dealing with rabies. Good thing you got your glasses back! And we wouldn’t want to be peed on. Sounds like you get a little more than you bargain for when seeing monkeys in India :-). Looks a fascinating place to visit and photograph and I too LOVE monkeys. It is a shame though that they are so humanized and feeding them should be discouraged but I can see that they would be the star attraction. The Stone Guardians look a little hacked off, if you ask me, that they aren’t getting any attention! Love your photos! Brings back fond memories for me too – my first solo trip was to SE Asia in 1993 and I spent a couple of months in Bali – Ubud was a favorite but i did not feed the monkeys or want them climbing on me. I would love to see the monkeys and I would probably want to feed a banana to one of them! I would be careful to hide jewelry and things as I wouldn’t want them climbing all over me! I love your pictures! The monkey photos are absolutely priceless. No, I would not like monkeys jumping on me—or on my bed! Oh my gosh – I LOVE monkeys! I would be in heaven here! I understand why many places don’t want you to feed them because it upsets the natural ecology, but it would still be cool just to be that close to them. Don’t worry – even if you don’t feed them, you’ll get VERY close to the monkeys :-). Glad we could help you trip happily down memory lane :-).